As we tend to observe from time to time, it looks like there is an eminent domain angle to just about everything. This time, this post has been inspired by our coming across an old story about U.S. land condemnations along the Mexican border for the purpose of erecting a border fence to keep Mexicans (and other Central Americans) from migrating illegally to the United States. Alas, as you read on, you will see that the process of acquisition of land for that fence, and its functioning upon completion, are not what you might call an exemplary government effort. Apart from the usual illegal immigration problems, this time, what has caught everybody’s attention, is the sudden migratory invasion from Central America that has taken the form of thousands of young kids, many of them making the perilous journey alone, braving the privations and hazards of the journey across hostile foreign lands. In this case the “foreign land” is Mexico. Mexico doesn’t cotton to the idea of foreigners, young and old alike, crossing its southern border en masse, and using Mexico as a transit way to get to the U.S. border, and thence north to fabled Gringoland where life is good, and Americans take care of you if you are a kid. Compared to the poverty-stricken, violent, failing states that are ruled by narcotics gangs, what’s not to like? Nominally, we in the U.S. purport not to cotton to this state of affairs either, but actually we tolerate it and de facto encourage it, particularly in the case of those child migrants who are well taken care of, housed and fed and placed in foster homes upon being apprehended on the U.S. side of the border. That beats the hell out of starving in Central America. Unsurprisingly, we say we want to exclude this flood of illegal migrants by maintaining a fence across the Mexican border, but that effort isn’t doing much good, as evidenced by the steady flow of illegal immigrants and those hordes of Central American kids just walking across the border on their way to the promised land. So that fence, as the saying goes, is a job that may be good enough for government work, but by other standards leaves much to be desired. In short, our fence has not been much of a success in spite of its $57.7 million price tag. Among other reasons, in the Otay Mountain area the terrain is dangerous and forbidding enough without a fence, so none has been built there, leaving that area as an entry point – albeit a dangerous one. Besides, to repeat ourselves, that fence can’t be much of a barrier since, as noted, Central American kids, are simply walking across our southern border by the tens of thousands, responding to rumors down there, that if you are a kid and you make it across the border, you’re home free – the gringos will take care of you. And so they do, inspiring a veritable flood of youngsters from all over Central America to brave the hazards of the journey and head north. As it happens, those kids turn out to be right. Soft-hearted gringos have been overwhelmed by this migratory invasion and don’t really know what to do about it, except to yield to their feelings of compassion and take care of the child-migrants, which as far as the latter are concerned was the whole object of the game. So the AK-47-toting Mexican coyotes and the pollos (their illegal immigrant charges) cross our southern border in droves, even though many of them suffer and die in in the harsh desert environment in the process. But our response to these tragedies is pretty much to shrug them off, and to enjoy the benefits of cheap, if illegal, Mexican labor. You sure don’t see the kind of lamentations that are routine – for example — in the case of the Israeli “wall of separation” (which is mostly a fence that keeps out terrorists). Here, in contrast with that Israeli fence, there are no lachrymose op-eds, no threats of boycotting anybody, no denunciatory UN resolutions — no nothin’. Most important, no terrorist attacks targeting the imperialist gringo“settlers” occupying Mexican land on the north bank of the Rio Grande. It’s an interesting case of judgmental asymmetry, making it clear that morally, something isn’t kosher here. So we decided to take a look at how such border fences are treated elsewhere. Here is a picture of that Israeli “wall” which is mostly a border fence like this. Check it out. And here is a photo of that Spanish fence around Melilla, being stormed by Africans trying to get into Spanish territory. So what’s going on here? Why is the Israelis’ border fence (called a “wall of separation,” though most of it is a fence) bad, as opposed to that Spanish fence which gets a free pass? More important to us, why is the Israeli’s fence bad but ours good? And please don’t try to give us the conventional wisdom propaganda about how the wicked Israelis are using that “wall” to occupy Arab land. The Israelis acquired the land in question – historically known as Judea and Samaria — in the process of defending themselves against a genocidal Arab attack in the 1967 six-day war. They captured it, along with the Jordanian-occupied part of Jerusalem and the Jordan Valley, when the Arabs massed their armies on Israeli borders, blockaded the Israeli port of Eilat – a casus belli in itself if you want to get technical about it – and announced their intention to annihilate the Israelis by “driving them into the sea,” as they were fond of putting it. Instead, the would-be conquering Arab armies – all four or five of them — suffered a humiliating defeat, while the Israeli army wound up recapturing territory that the Arabs had captured after invading it in the 1948 Israeli war of independence. So we are hardly in a position to cast stones because, apart from all that, we have been occupying Mexican land conquered in the Mexican-American war that we started without just cause, simply as an act of gringo imperialism. You can conveniently check out the historical facts on Wikipedia, under Mexican-American War. In fact, not to put too fine a point on it, we Southern Californians live in gringo settlements on the conquered and occupied north bank of the Rio Grande. So why is our aggressive conquest of Mexican territory to which we had no legitimate claim good, but the Israelis’ defensive conquest of their ancestral land of Judea and Samaria (now known as the West Bank of the Jordan River), bad? These days, what the Israelis are about in building and maintaining that “wall” separating Israel from the “West Bank” is to keep Arab terrorists from sneaking into Israel – an activity that the Israeli fence has interdicted admirably. Arabs who have legitimate business in Israel or in the Israeli held territories are free to cross it peaceably, even if that may require waiting in a long line at a border checkpoint, not all that different from the case of folks who wish to cross the U.S.–Mexican border. If the L.A. Times is to be believed, four-hour waits are not uncommon in both instances. More important is the parties’ motivation; unlike the Israelis, we have built that Mexican border wall not to exclude suicidal Mexican terrorists (who for some reason are not much in evidence around San Diego), but to keep poor Mexicans from sneaking into the U.S. in search of work, in an effort to put food on their children’s tables. So who are we to kvetch at another country that has to worry about keeping out border-crossing suicide bombers? In case all this talk of border fences has stimulated your interest in international border walls, you can check out that subject on Wikipedia which informs us that there are over a half-dozen border separation walls or fences currently in use all over the world, notably in places like Morocco (of which more presently), the Iran-Pakistan border, Cyprus, the Saudi-Yemen border, the Malaysia-Thailand border, the Kuwait-Iraq border, and the China-Korea border. So why no fuss about any of those? Why complain only about the Israeli, clearly defensive fence? Even Pope Francis has gotten into the act. During his recent visit to Israel he made a point of displaying his concern over the plight of Arabs who are concededly inconvenienced by that fence over there, though for non-terrorist Arabs crossing it is not all that different or time-consuming than what is required to cross our southern border. I find that puzzling. Would the Pope feel better if there were no fence, and Arab terrorists could easily walk into Israel over and kill unarmed Israeli civilians with suicide bombs? I don’t think so; he seems like a nice fellow who would abhor such a state of affairs. Still, his display of concern over that Israeli “wall of separation,” but no other, does make one wonder what’s going on here. What is more interesting, is that you almost never hear much about yet another border fence — the one erected by Spain in North Africa. It separates Spanish-occupied territories of Melilla and Ceuta from Morocco whose inhabitants, along with hordes of desperate migrants from sub-Saharan Africa, do their best to get across it in order to gain a foothold in that European enclave, so they can get from there into Europe and get a leg up in the struggle to improve their wretched lives. Sort of like the poor Central Americans who struggle to cross our southern border in order to improve their lives in our first-world economy. 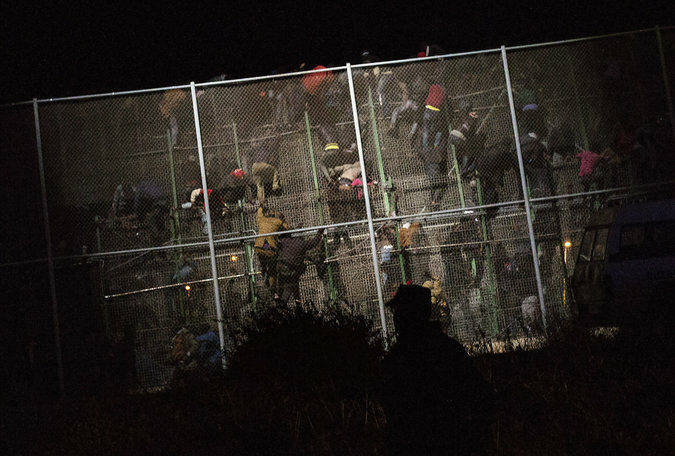 And if you doubt me, and want to see things for yourself, check out photos of poor Africans storming that Spanish-built Melilla fence in order to make it into Spanish-held territory, and thence into Europe where they can get a crack at a better life. If you want to see the N.Y. Times’ take on this problem, click on http://www.nytimes.com/2014/02/28/world/europe/africans-battered-and-broke-surge-to-europes-door.html. It reports inter alia that the Spaniards are not content to let their fence do the excluding. They help things along by firing rubber bullets at the would-be African border crossers, killing a number of them in the process. But wait a minute! What in the world are Spaniards doing occupying and ruling parts of North Africa? And why aren’t they being denounced for their colonialist “occupation” by the U.N., the peace-loving churches and NGOs, and all those other enlightened folk who never tire of bashing Israel for protecting itself in the same way, even though the latter’s claim to their ancestral territory in the Holy Land is considerably stronger than Spain’s claim to Africa. Why revile the Israelis as “occupiers” while giving the Spaniards a free pass? “Is a puzzlement,” as the King of Siam used to say to Anna. Or is it? So being the sort who tends to be concerned about similarly situated folks being treated alike, I wonder why no concern has been expressed over that Spanish “wall” and its exclusionary effect on poor Africans who are trying to get a piece of a better life for themselves and their kids. Of course, an effort to get the Spaniards to tear their fence down would be a hard sell because the Spaniards are no dummies, and they remember the mass slaughter of their people effected by North African terrorists’ attacks on the Madrid subway only a few years ago. So if the Spaniards want to keep their fence good and tight, who can blame them? But then again, why blame the Israelis for doing exactly the same thing for the same and, if anything, stronger reason? Bottom line: If you perceive a – shall we say? — asymmetry in the intensive press coverage of the “wall” that protects Israel, as opposed to the bare mention of the Spanish fence separating Morocco from Melilla, and the lack of similar concern over the American fence on our southern border, that’s a subject worth pondering. A truthful insight into the respective motivations in these instances of border fence-building would be nice. But your faithful servant is a realist who is ever mindful of the fact that all too often answers to moral questions that arise in the context of international realpolitik depend, not on any principled policy decisions, but only on the ever-shifting answers to the question of whose ox is being gored. So we are not holding our breath waiting for an international display of even-handedness where that Israeli “wall” is involved. And what we find really disturbing is why the American media are ever ready to offer excuses for the Middle Eastern terrorists, that amount to a handing out a moral free pass in such matters, in spite of their demonstrable, avowed, and often lethal hostility to America and Americans. Follow-up: We learn from today’s L. A. Times (Texas Warns of a Border “Trail of Tears,” June 24, 2014, at p. A5), that so far this fiscal year some 52,000 “unaccompanied youths” have been caught along the border, almost double last year’s total. Brooks County, Texas, has recovered 87 bodies last year, and 129 bodies the year before. Thirty-eight bodies so far this year. And if you are into the fiscal side of this calamity, Senator Dianne Feinstein informs us in an L.A. Times op-ed of the same date, that the Senate Appropriations Committee has just approved $.94 billion (with a “b”), for something called “Unaccompanied Alien Children program”, which the Senator characterizes as a “good start.” She expects that sum to be matched by the House of Representatives. Dianne Feinstein, Desperate Children at the Border, L.A. Times, June 24, 2014, at p. A11. Second follow-up. We learn from today’s N.Y. Times that our border fence has been so placed that it is impossible to enter or leave the town of Arivaca, Arizona, without having to cross a U.S. border checkpoint, a state of affairs that has angered the affected American town population. See Jess Bidgood and John Schwartz, Border Patrol Scrutiny Stirs Anger in Arizona Town, N.Y. Times, June28, 2014, at p. A13. Alas, Goats in Detroit Are Verboten! Remember the news from a while back, which prophesied that Detroit could be saved by converting land once occupied by abandoned building into farms? Sure you do; we wrote about here repeatedly. Well folks, it turns out that some nabob with more money than brains, cottoned to the idea, so he decided to get the agricultural ball rolling by importing a couple dozen goats in the hope that they would munch up the weeds sprouting on the land in question, thus sort of cleaning the place up and nourishing themselves. Alas, it didn’t work out. As soon as the goats were turned loose, the city said ix-nay and ordered the goats removed. So instead of gamboling in the weeds the goats will be shipped to a slaughterhouse, may they rest in peace. For the story, see Goats Exiled from Detroit Head for Early Slaughter, http://www.planetizen.com/node/69540?utm_source=newsletter&utm_medium=email&utm_campaign=06232014 compleat with pictures. 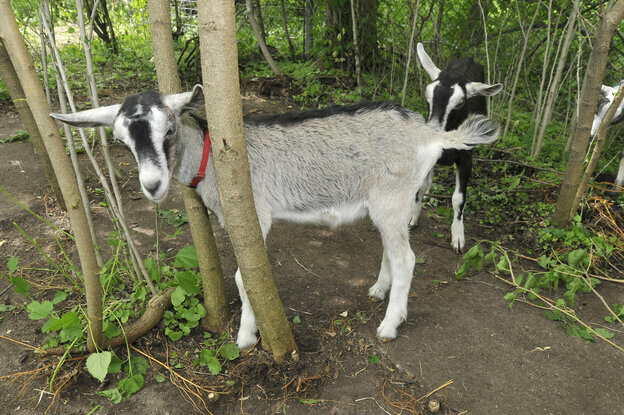 Goats graze in Detroit’s Brightmoor neighborhood. “The Republican-controlled U.S. House of Representatives passed legislation Tuesday to stop federal funding for high-speed rail in California. The Salem Observer reports a jury award of $13.5 million on the state’s offer of $3.97 million for the taking of 30 acres for a highway. Plus, the state will be paying $1.2 million in interest. The details as to the legal issue that divided the parties are unclear, but they evidently involved the parties’ disagreement as to the proper extent of the necessary taking. See Gary Rayno, Salem Observer, Former Wyndham Landowner Awarded 13.5m in Eminent Domain Case, June 4, 2014. Click on http://www.unionleader.com/article/20140603/NEWHAMPSHIRE1411/140609674 for the story. The Ripeness Rule in Taking Cases is Based on SCOTUS’ Misreading of Tennessee Law. Recent high-class law blogs have been taking Justice Antonin Scalia to task for his assertedly “cringeworthy” attribution of a legal argument to the EPA, whereas it had been made by a party in an earlier case. Oh, dear. See Jacob Gershman, Supreme Court Corrects Scalia’s “Cringeworthy” Error in Pollution Case, Wall Street Journal Law Blog, April 4, 2014, This error had no effect on the substantive law in issue, and was promptly corrected, but not before inspiring snarky commentary aimed at Scalia charging him with not knowing what was in his earlier opinion. Also, Justice Kagan got it from the bloggers for misstating the original location of the Jewish-American community. Oy. Adam Liptak, Final Word on U.S. Law Isn’t: Supreme Court Keeps Editing, N.Y. Times, May 25, 2014. To say nothing of Justice Alito also getting it for his asserted statistical methodology shortcomings. But what has not received any attention among the legal mavens scrutinizing Supreme Court opinions, is that in an earlier important opinion in which the Court (speaking through Justice Harry Blackmun), committed a far worse, doctrinal blunder that misinterpreted Tennessee takings law, and thereby distorted federal law of ripeness, thus de facto barring American property owners from receiving consideration of their federal constitutional claims in taking cases. It isn’t every day that a state supreme court lays it on the line and makes clear that the U. S. Supreme Court has misunderstood a state law rule, but it happens and it has happened again in the takings field. You may recall that in Williamson County etc. Commission v. Hamilton Bank, 473 U.S. 172, 194-195 (1985),the Supreme Court refused to provide relief to the aggrieved property owner seeking compensation for a regulatory taking of its land by confiscatory land-use regulations because it found the case unripe. Why? Because, among other things, the owner who claimed compensation for a regulatory taking of its property had not first sought just compensation in the state courts. Why would such a detour through state courts be necessary? No other species of plaintiffs suing under 42 U.S.C. § 1943 is required to do so. Indeed, in Patsy v. Board of Regents, the Justices made it clear that no exhaustion of state remedies is required before suing in federal court under 42 U.S.C. § 1983 for a violation of constitutional rights. True enough, Justice Blackmun characterized this procedural wrinkle as a search for ripeness, not as exhaustion of state remedies. But in practice this thin distinction has been largely ignored by lower federal courts which demand that plaintiffs claiming uncompensated regulatory takings, first exhaust all their available state remedies. Thus, in Williamson County, the court asserted that a taking of private property is unconstitutional only when accomplished without just compensation, so the property owners’ claim of taking is unripe until after they seek but are denied the lacking compensation by state courts. But the same is true of all rights – including life and liberty – that are protected by the Due Process Clause of the 14th Amendment. They may not be impaired without due process, but are substantively fair game if due process is provided. But only the plaintiffs in taking cases are required to “ripen” their federal causes of action by first suing for relief in state court. What makes this procedure really bad is that when the taking plaintiffs duly comply with Williamson County, and take their detour through state courts, they discover that the state court decision is deemed by the federal courts to be res judicata, and they thus can never obtain an adjudication of their federal constitutional claims. The Court’s ripeness holding in Williamson County was explicit and unmistakable: “If the [state] government has provided an adequate process for obtaining compensation, and if resort to that process ‘[yields] just compensation,’ then the property owner ‘has no claim against the government for a taking,’” and therefore it follows that “the property owner cannot claim a violation of the Just Compensation Clause until it has used the procedure and been denied just compensation.” “The Tennessee state courts have interpreted § 29-16-123 to allow recovery through inverse condemnation where the ‘taking’ is effected by restrictive zoning laws or development regulations.” Emphasis added. Thus, said the court, since the Williamson County plaintiffs failed to sue first in state court, their taking claim was unripe and its filing in federal court was premature. That would have been bad enough, but we have learned since then Tennessee law said no such thing. Rather, Tennessee law in question is limited to providing relief in cases of physical takings, not regulatory takings. Don’t take my word for it; you can easily check it out for yourself. Just keep on reading. Since what was in issue was the interpretation of Tennessee state law of remedies, it would seem only prudent to see what the Tennessee courts have had to say about all this. After all, the U.S. Supreme Court is a federal court that deals with federal issues and does not provide authoritative interpretation of state law. It is the state courts that have the last word on that. So did the Tennessee law in 1985 (when Williamson County came down) provide a compensation remedy for regulatory takings? No, it did not. And it still doesn’t. We know this because the Tennessee Supreme Court told us. Explicitly. Check out B & B Enterprises of Wilson County v. City of Lebanon, 318 S.W.3d 839 (Tenn. 2010), and there it is in black-on-white: “[T]his court has not yet held that a regulatory takings claim can be asserted under Article I, Section 21 of the Tennessee Constitution. Currently, we have recognized only two types of takings claims – physical occupation taking claims and nuisance-type takings claims. Regulatory takings do not fall into either of these categories.” 318 S.W.3d at 845, (citations omitted, emphasis added). The Tennessee Supreme Court went on to note that the B & B case before it was “not a proper vehicle for deciding the existence or scope of a regulatory taking under Article I, Section 21,” of the state constitution, because it dealt with limitations – i.e., “when is such an action timely, assuming for the sake of argument that it exists, rather than when it becomes ripe for litigation.” Which brings us to the point of this article. The bottom line is that the U.S. Supreme Court was simply wrong in the Williamson County case when it asserted that Tennessee law provided a compensatory remedy for regulatory (as opposed to physical) takings. Williamson County thus misread Tennessee law. We can’t expect the Justices to be mavens of Tennessee law. But it is now clear that the Williamson County ripeness holding is based on nonexistent Tennessee law and is thus unsound. Would the Williamson County case been differently decided had the Supreme Court Justices understood that the plaintiff had no Tennessee state law remedy? One would hope so. So in addition to Williamson County’s many other faults that unleashed a torrent of scholarly invective directed at its merits, and inspired four concurring Supreme Court Justices to suggest in the San Remo Hotel case that Williamson County should be reconsidered, we now have a definitive interpretation of Tennessee law by the Tennessee Supreme Court which tells us authoritatively that Williamson County was erroneously decided as supposedly allowing regulatory taking actions in Tennessee state courts, when in fact it did no such thing. From which follows the ineluctable conclusion that the doctrinally deficient, and intellectually rickety “ripeness doctrine” foisted on this long suffering field of law by the Williamson County case and its progeny, stands on feet of clay. And as for the would-be mavens who have been so eager to rag on the Supreme Court Justices for trifling and easily correctable, non-dispositive misstatements in their opinions, their efforts would be better employed in spotlighting Justice Blackmun’s Williamson County blunder that has now been exposed by the Tennessee Supreme Court as incapable of supporting the wretched Williamson County ripeness rule. Which brings us back to the beginning and all those classy bloggers who profess to be upset by minor judicial gaffes in recent opinions. They would be better advised to call on the court to acknowledge its mistaken perception of state law that led it to create what has become known as the Williamson County “ripeness mess” and to rectify it at the earliest opportunity.